Winter TNNA was great for me. I didn’t have many expectations (I’m not sourcing yarn for any upcoming projects; it’s nice to not have to ask folks for yarn!) and not a lot on my to do list. I did have a few folks I needed to meet up with, and that all went fantastic. I showed off my Achillea Cowl pattern to the folks at Dream in Color and Lorna’s Laces. 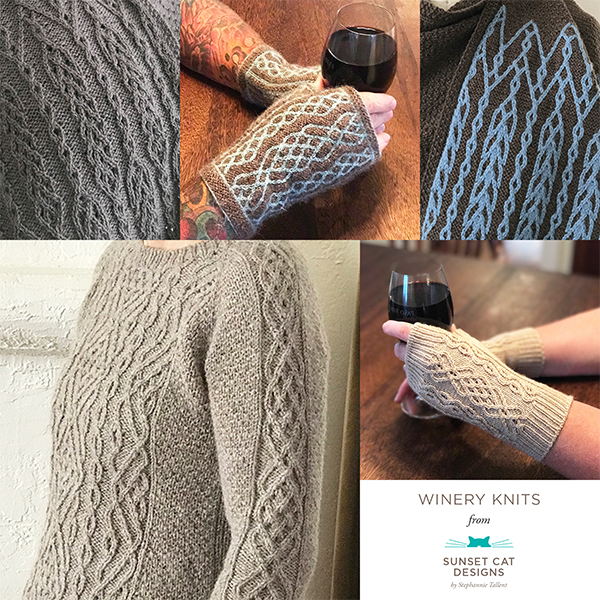 For the most part, though, I was able to touch base with other designers, see some new yarns and colorways, and help my pal Michelle. I did pick up a few things: a gorgeous new bag from Namaste (below, center) that I’d been coveting since TNNA last summer, some of the sharp needles from Hiya Hiya (below, right), a new interchangeables needle holder from Offhand Designs (below, right) for my new set of ChiaoGoo interchangeables that I ordered…and a selection of really nice reading glasses (to be delivered as well). I had a lovely chat with the folks at Koigu. They gave me a couple lovely skeins that are just crying out for colorwork (above, left). Michelle gave me two skeins of Tilli Tomas sock (above, right) that are also due for some serious colorworking. The little swatching skeins are from Swans Island. I had a serious fangirl moment with Erika Knight. She’s gracious and funny and elegant and ever so nice — she liked my designs! and made me swear to come back on Monday to get yarn to play with! I got chills when she told me how much she liked California Revival Knits. In all seriousness, I think getting validation and praise from someone you don’t know, who’s so established in the field, is one of the best things to experience and to give you a big confidence boost. Her new yarn, British Blue Wool, distributed by Blue Water Fibers, is lovely — I’m already plotting some accessory patterns that will take advantage of the yarn’s subtle luster, softness, and colorways.